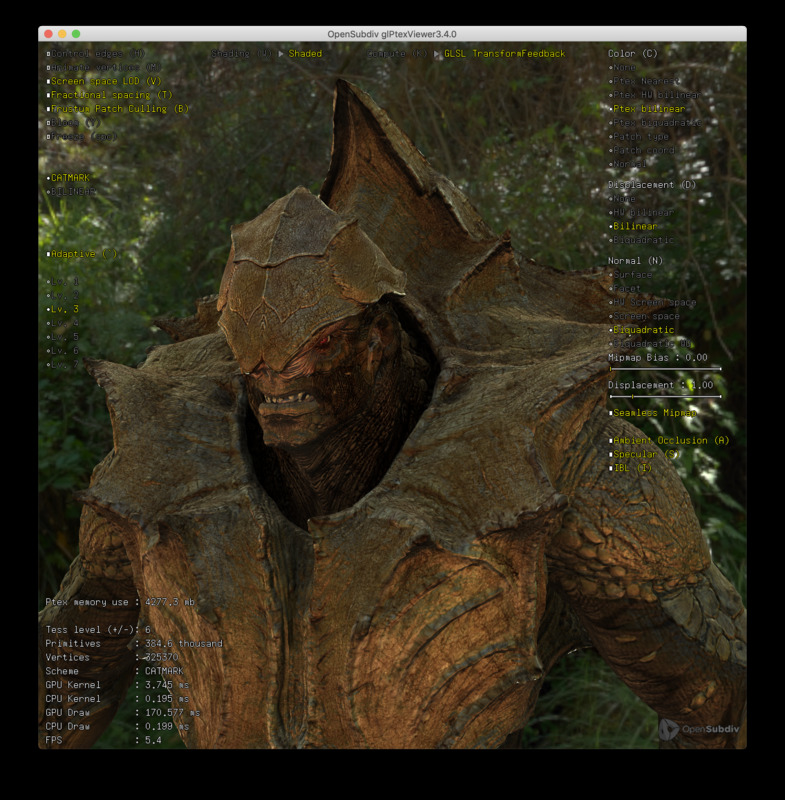 glPtexViewer is a stand-alone application that showcases advanced HDR shading with color, displacement, occlusion and specular ptex maps. Multiple controls are available to experiment with the algorithms. A low dynamic range spherical environment map used as a background. Ideally, a color-normalized version of the HDR light probe. An HDR file containing a diffuse environment map (typically they are low resolution blurry hemispherical convolutions of the environment light probe). An HDR file containing a specular environment map. A scalar multiplier for the shader displacement values. A scalar multiplier for the shader bump values. Swap Z-up geometry to Y-UP. Select the desired isolation level of adaptive feature isolation. This can be useful when trying to load large pieces of geometry. A ptex file containing RGB channels read as material albedo color. A single-channel ptex file (preferably float precision) containing the displacement values. A single-channel ptex file (preferably 8 bits precision) containing a pre-computed ambient occlusion signal. Generated on: 2018-07-19 18:43 UTC.